A portion of a photograph from “Selma, 1965: Bruce Davidson and the Photography of Civil Rights” at the University of San Diego. A photography exhibit commemorating the 50th anniversary of the historic civil rights march from Selma to Montgomery opened Friday at the University of San Diego. “Selma, 1965: Bruce Davidson and the Photography of Civil Rights“ includes nearly 60 black and white images by Bruce Davidson and James Karales, both of whom spent time documenting the Selma March and associated violence. 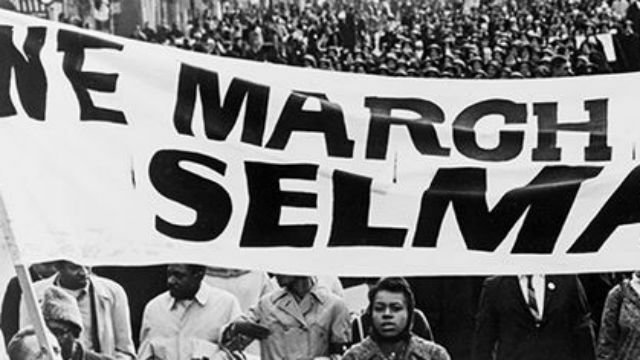 The vintage photographs depict Martin Luther King Jr., as well as thousands of marchers who made the 54-mile trek between Selma and Montgomery in protest of widespread voting rights abuses in the South. The exhibition was organized by the university galleries and is presented in collaboration with the Joan B. Kroc School for Peace Studies. University art history students wrote the exhibition labels and participated in the planning of the landmark project. The exhibition, which is free and open to the public, runs through March 22 at the Kroc School. The gallery is open from noon to 5 p.m. weekdays, with an extra hour to 6 p.m. on Thursdays.